Using the Wayback Machine, emersonbiggins from peakoil.com has kindly unearthed the Y2K predictions of James Kunstler written in the pre-Y2K period. This is all very amusing because it turns out that Kunstler made exactly the same predictions for Y2K as he is now making for peak oil. "Y2K is real. Y2K is going to rock our world." It turns out that the Y2K stuff is still on Kunstler's server, but it's not linked from anywhere on his site, which makes the information impossible to find without the URL. This is material which Kuntsler is not proud of. Highly embarassing material he wants to bury and hide. So here's a tip for all you media people out there. When you interview Kunstler, you don't want to just let him run loose. If you do that, he's just going to start rattling off the usual doom-and-gloom spiel out of that rodent-like face of his. He's like a wind-up toy, so you don't want to press that button. Why is it that we're supposed to listen to you -- a fiction writer, with no technical expertise whatsover -- on a technical subject like Y2K or peak oil? Didn't you make exactly the same predictions once before regarding Y2K? Let me read you a few of them, as archived on your website. What happened there Jimbo? 1. From Duh to Huh? Writing this in April of ‘99, I believe that we are in for a serious event. Systems will fail, crash, seize up, cease to function. Not all systems, maybe only a fraction, but enough, and enough interdependent systems to affect many other systems. Y2K is real. 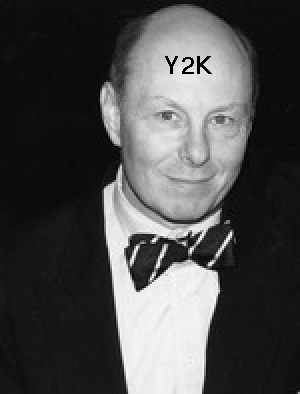 Y2K is going to rock our world. People will consequently suffer. I don’t know how much. Some people may lose their lives - but more likely at the hands of a disabled medical establishment than because of civil disorder, loss of power, starvation, bad water, or other projected horrors (though these, too, are possible). Some will suffer the loss of fortunes, some of any income whatsoever, and many of something in between. Quite a few will find themselves suddenly without an occupation, and few ideas about how to make themselves useful to other people (without occupations themselves). Many will suffer a loss of comfort and modern convenience, and if that goes on any longer than a week, it may escalate into serious problems of public sanitation and infectious disease. The foregoing may seem to be little more than unsupported generality. I will be more specific below. I won't knock myself out trying to empirically demonstrate the "truth" of these assertions. It seems to me that the Y2K problem is so broad, systemic, and unprecedented that imagining its repercussions calls for something beside conventional thinking. Many of the effects I anticipate will not be provable one way or the other until the interconnected and interdependent skein of events this problem represents plays out. Since the effects of Y2K are apt to follow fractal pathways of self-organization - with strange, surprising twists - understanding them may be better served by a mind in free flight. These scenarios therefore should be taken for what they are: an exercise in human imagining. Nor will I go into the technical history of Y2K as a computer programming blunder. There are more than enough concise essays about that elsewhere on the internet and in other media. I assume that anyone reading this already knows enough about underlying problem. I am more interested in the social, economic, cultural, and political ramifications. Personally, I have moved from an emotional state of surprise, to alarm, to despair, and now to hopeful anticipation of Y2K in the months since I first heard my wake-up call. It was a lovely July day, 1998. I was driving to Schroon Lake on the Adirondack Northway (I-87) when Senator Robert Bennett (R-Utah) came on a noontime NPR broadcast and told the audience that Y2K was a global problem that had to be taken very very seriously. He explained why. It was all new to me. Up until then, all I’d heard about the Y2K "bug" was that it might screw up a few computerized accounts receivable. Senator Bennett’s message was a clear and plausible warning that there was much more to it, and he did a good job of outlining the areas of concern: the power grid, telecommunication, nuclear arsenals, manufacturing supply lines, industrialized agriculture and so on. He certainly didn’t come across as a nut. This leads to another major aspect of Y2K. I believe it will deeply affect the economies-of-scale of virtually all activities in the United States, essentially requiring us to downsize and localize everything from government to retail merchandising to farming. Particulars below. If nothing else, I expect Y2K to destabilize world petroleum markets. These disruptions will be at least as bad as those produced by the 1973 OPEC oil embargo (so-called). The aftershocks of that event thundered through the American economy for the rest of the decade, giving us several years of interest rates above 15 percent and a weird malaise that puzzled economists called "stagflation (stagnation + inflation). The OPEC embargo involved a lot of backstage political shenanigans, but apart from these, the actual market shortfall appears to have been about five percent of our imported oil. In 1973 less than half of our oil came from foreign producers. Today, more than half does. Of that, at least 30 percent comes from countries that are considered unprepared for Y2K, countries over which we have no control and limited influence. I doubt that the WalMarts and K-Marts of the land will survive Y2K. Their fabulous success the past 20 years had been due to the combination of continually falling gas prices, relative world political stability (and long distance outsourcing of cheap labor), and computerization. They operate at extremely narrow profit margins. They will not be able to adapt to even modest changes, and especially fluctuations, in their business equation. In order for WalMart to make a $100 profit, it has to ship 1000 plastic wading pools from California to Pennsylvania - and then sell at least 997 of the wading pools. What happens to their profit margin if the price of truck fuel goes up even modestly - say 30 cents a gallon (which by international standards would be a tiny increase)? What happens to WalMart if their customers’ disposable income decreases by seven percent? What happens if their merchandise supply chain is interrupted by the Y2K problems of their thousand-fold vendors? Or if their own systems produce corrupted data. Or if all the above happens during the same time period? It seems to me that national chain retail is exactly the kind of activity that has achieved an absurd and inadaptable economy of scale, and that they will not be able to function in a post-Y2K world. The aftermath of Y2K will require us to do things differently. We are going to have to live more locally, and more self-dependently. All our activities will have to be conducted on a finer scale. The "move to quality" that is sometimes invoked in discussions of financial investments will apply across the cultural and economic board. There will be less room in our lives for junk of all kinds: junk food, junk merchandise, junk entertainment, junk relationships. We are going to have to re-invent smaller-scaled farms (with value-adding activities), and we’re going to have to localize, or at least regionalize, commerce. We may have to start making some things again ourselves, or do without them for a while. WASHINGTON (AP) -- Natural gas futures declined to their lowest level in almost a year on Friday amid soaring inventories of the mostly domestic fuel used to heat homes and produce electricity. Analysts said the price of natural gas could fall even further in the months ahead, given relatively weak demand and expectations of rising supplies, though they cautioned that production in the Gulf of Mexico remains hindered by damage from last year's powerful hurricanes Katrina and Rita. As you can see, in real terms, the price of food/gasoline hasn't increased at all over the last 20 years. The Inga Dams on the Congo have the potential to power the entire continent of Africa and its future industrialisation AND even sell excess electricity to Europe. Inga has the world's largest hydroelectric potential (42,000 MW, which equals 40 BIG nuke plants, or 100 BIG coal-fired power plants), bigger than the Three Gorges and the Itaipu. But nobody knows the Inga - and peak oilers simply don't want to know it. Dictator Mobutu and the Belgians built it, then it went dead because of the civil war in the Congo, but now it's being rebuilt -- by credible investors (South Africa's ESKOM and the world bank, etc...), and by "the Chinese", who dare to venture in African projects where the Belgians or the Americans no longer dare to. The Inga is a natural complex of rapids, with a natural reservoir (head: 150 metres). So there's no additional methanogenesis caused by man. And even if the Grand Inga (extension of the reservoir) were to put a huge area under water, the advantage is that the region is a moon landscape. I know the place, I've seen the region, and the rapids are located in a huge dead zone of rocks, there's not a single tree there. So no 'pristine' rainforests, no extra methane. Some use the methane argument against dams - but it's absurd: for none of the big dams it makes sense, as these offset much bigger amounts of CO2 than they add GHGs. By the way, Inga will be inscribed as a U.N. Clean Development Mechanism project. Now others will say: "this doesn't give Africa liquid fuels". But they're so wrong. The DRCongo, neighboring Republic of Congo and the Central African Republic have the potential to produce between 5 and 10 million barrels a day of sugar/cassava ethanol (no need to cut a single tree) and palm biodiesel. (Some estimates go so far as to say 15 million bpd). Without endangering food production. Inga hydropower will provide dirt cheap electricity which will be used to power the biofuel processing plants. There's even talk about a biofuel pipeline from Kinshasa to the Atlantic port of Banana, where a bioterminal might be built. (Brazil's building a 1000km ethanol pipeline systemSource, so it's not a fantasy). Really, the Congo's and the CAR are huge countries (only 5% of all arable land is being used currently), and they will become the Green Opec together with Brazil (and other Latin American countries). Voilà, I hope this news is of use to you. Most people have never heard of the Inga. Most people don't know the bioenergy potential of Central-Africa. Most people don't know that there are two countries called Congo. Most people don't know that these countries have vast unused land potential (it needs investment, nothing else). Most people don't realise that Africa not only exports petroleum, but that in the near future it will even sell electricity and biofuels abroad. In vast quantities. As we approached the 300th article here at Peak Oil Debunked, I was wondering what to write to mark the occasion. So I took a few days off and mulled it over. I came to the conclusion that peak oil is a non-event, which has no significant impact on my daily life. Oil is up by about 600% since the late 90s, So where's all those scary peak oil effects?? You know, the knock-on effects caused by the end of cheap oil. Call me crazy, but when I step out my front door, things look EXACTLY like they did when oil was cheap. I mean EXACTLY. The roads are choked and overflowing with cars. The freeways are clogged with traffic jams so long you can't even see the end of them. The shelves in the supermarket still look the same. Same products. Same prices. Tidal waves of plastic junk, curios and fresh vegetables continue to fly in from all corners of the earth. Plastic bags continue to be as plentiful as they've ever been. There's been no perceptible slack-off in junk mail volume. Seriously, if you blindfolded me, put me in a time machine, took the blindfold off, and then asked me: Where are we? Are we in 1998 with an oil glut, or in 2006 after the end of cheap oil, I wouldn't be able to tell the difference. The reality just isn't matching up with the rhetoric. Where's the die-off? And the marauders? And the sky-rocketing prices at the supermarket? And the implosion of Walmart? And the death of Phoenix? And the shootings at Gas-n-Go? And the national temper tantrum? And the failure of oil-intensive agriculture? And the mass migrations from the suburbs? And the endless depression? And the collapse of the dollar? And the collapse of fiat money? And hyper-inflation? And deflation? And the nuking of Iran? And the popping of the housing bubble? And the reinstitution of the draft? And China and the U.S. nuking each over Campbell's soup cans? Kunstler's got it right calling peak oil the Long Emergency. It's going to take so long that it's not even worth paying attention to. Now I know what the doomers say: "You wait, man.. You just wait..."
My response: No, sorry, I'm tired of waiting. I'll be doing something more constructive with my time than playing we're-going-to-collapse/no-we-won't/yes-we-will with peak oil burnouts and neurotics. I'll start worrying when something worth worrying about actually happens. I will be maintaining the site as a resource for those just coming to peak oil, and will post important stats or information when appropriate. But this blog will not be the place to get a daily peak oil fix. I have basically achieved all I set out to accomplish with this site. Thanks to all of you for your support, and keep debunking!! Yesterday, peak oil maharishi Richard Heinberg released his latest effort -- another blather salvo on the "population problem" called Population, Resources, and Human Idealism. So the population reduction scenario with the best chance of success has to be Darwinian in all its aspects, with none of the sentimentality that shrouded the second half of the 20th Century in a dense fog of political correctness. . . . The Darwinian approach, in this planned population reduction scenario, is to maximise the well-being of the UK as a nation-state. Individual citizens, and aliens, must expect to be seriously inconvenienced by the single-minded drive to reduce population ahead of resource shortage. The consolation is that the alternative, letting Nature take its course, would be so much worse. The scenario is: Immigration is banned. Unauthorised arrives are treated as criminals. Every woman is entitled to raise one healthy child. No religious or cultural exceptions can be made, but entitlements can be traded. Abortion or infanticide is compulsory if the fetus or baby proves to be handicapped (Darwinian selection weeds out the unfit). When, through old age, accident or disease, an individual becomes more of a burden than a benefit to society, his or her life is humanely ended. Voluntary euthanasia is legal and made easy. Imprisonment is rare, replaced by corporal punishment for lesser offences and painless capital punishment for greater. Wartime, Adolf Hitler suggested, "was the best time for the elimination of the incurably ill." Many Germans did not want to be reminded of individuals who did not measure up to their concept of a "master race." The physically and mentally handicapped were viewed as "useless" to society, a threat to Aryan genetic purity, and, ultimately, unworthy of life. At the beginning of World War II, individuals who were mentally retarded, physically handicapped, or mentally ill were targeted for murder in what the Nazis called the "T-4," or "euthanasia," program. The "euthanasia" program required the cooperation of many German doctors, who reviewed the medical files of patients in institutions to determine which handicapped or mentally ill individuals should be killed. The doctors also supervised the actual killings. Doomed patients were transferred to six institutions in Germany and Austria, where they were killed in specially constructed gas chambers. Handicapped infants and small children were also killed by injection with a deadly dose of drugs or by starvation. The bodies of the victims were burned in large ovens called crematoria. What does Heinberg have to say about all this? Well... he definitely doesn't distance himself from it. He quotes Stanton with respect -- calling him a "thorough and proud Malthusian", and even claims that Stanton isn't a fascist: "The proponents of fascistic "solutions" (I'm not suggesting that Stanton is in that category, by the way)". Kind of makes you wonder what you have to do to be a fascist in Heinberg's book. Apparently it isn't enough to advocate the elimination of human rights, medical slaughter of the elderly and handicapped, abortion at gunpoint and the death penalty for animal rights advocates. Yup, Heinberg has crawled into bed with Stanton, and they're having a cute little spooning session, but your know what? Who cares? Stanton, Campbell and Heinberg are all just a bunch of peripheral, wannabe vermin who have no pull whatsoever in the real world. Obviously, Heinberg wants to attract attention and create a sort of "good cop/bad cop" effect. Listen up, he says, if you don't cooperate and do what I say, we're going to loose the dogs like Stanton on you. We need to get that population down, by hook or crook, and we can do this the easy way (which Heinberg doesn't specify) or we can fire up the ovens. The choice is yours. Well, here's my choice, Richard. I'm going to completely ignore you, like the skinny, impotent, milk-toast liberal you are. When you make up your mind what you stand for, I'll pay attention. If you want to advocate for voluntary population control measures which respect the human rights of the persons concerned -- who cares? Nobody disagrees with that. If you want to go further and push authoritarian one-child programs, or start killing retards with Willie Stanton, be my guest. Go on CNN with your "program". You'll be razzed and ridiculed as a lunatic. Personally, I don't think that'll happen though. I don't think you've got the nards for anything more than vague generalities and poetry readings.